Incorporate the results of those experiments (positive or negative) into new hypotheses. In a clinical trial, the hypothesis typically being tested is that a drug, given in a particular dosage and on a particular schedule, will have a positive effect on the symptoms or progression of a disease. To assess this kind of hypothesis, an experiment needs to be able to compare the symptoms or progression of the patients treated with the drug with another set of patients who didn’t get the drug. The best way to do this is through a process called a randomized controlled trial. In this kind of trial, patients are enrolled based on a specific set of criteria. A trial has inclusion criteria, which a patient must meet to be eligible for the trial. This would include the disease or condition that the trial is focused on, of course, but it can also include a lot of other factors, such as age, gender and previous treatments. For instance, a cancer drug might be given as a follow up treatment to a round of chemotherapy, so prior chemotherapy would be an inclusion criteria. In these days of increased genetic testing, inclusion criteria can even include the presence or absence of specific genetic factors. In cancer especially, factors like cancer-causing mutations in genes like BRCA1 or KRAS are often part of inclusion criteria. There are also exclusion criteria, which are things that would exclude a patient from a trial. Examples of exclusion criteria are other diseases a patient might have, or other factors that might affect how well the patient would respond. The goal of the criteria for a trial is often to limit the amount of variability in the patient population. For example, if patients with diabetes didn’t do as well when treated with a cancer drug, you might want to exclude them from the trial. However, randomized control clinical trials are designed to reduce the effect of that kind of factor. The idea is that there are surely going to be patient characteristics that influence how well they respond to a drug. This is the general concept behind personalized medicine. But it’s also clear that it is very hard to know in advance what all these factors are. So this is addressed by leaving it up to chance whether a patient in a trial gets the drug or not. This approach ensures that patients with unknown, confounding factors end up in both arms of the trial in fairly equal numbers. Ideally, the idea of randomization would be extended so that nobody would know what arm a patient was in. This is called blinding, and it’s important because it has been found that patients and doctors can behave differently if they know which arm they are in. You can imagine that if you knew that you were being treated with an experimental new drug, you might feel better about your prognosis than if you were being treated with an existing drug. Blinding is sometimes unrealistic, however, since a trial might be comparing a drug you take orally versus one given by injection. In addition to a two-arm trial where one arm is given the new drug and one is given a placebo or standard treatment, there are many more complex trial designs. I’ll discuss a few of these briefly. One is a multi-arm trial, in which more than one new drug is tested. This might mean that patients are randomly assigned to one of three arms, or there might be a specific factor that defines what arm a patient goes into. One advantage of this type of trial is that there only needs to be one control arm to test two drugs. Another new type of trial is a basket trial. Normally in diseases like cancer, trials are designed to treat specific cancer types that are based on the organ the cancer is found in. One trial might treat lung cancer while another might treat colon cancer, for instance. Recent research has suggested, however, that there are common factors that occur in cancers regardless of what organ they are found in. A basket trial would involve identifying specific mutations in a patient tumor and then assigning them a drug that targeted that mutation specifically. An example of this kind of trial is NCI-MATCH, which is testing dozens of new targeted cancer therapies. This blog post covers the same part of the Map of Biomedicine that the last one did, but now I’ve started to talk about matching patients to trials, and to drugs, based on genetic factors. 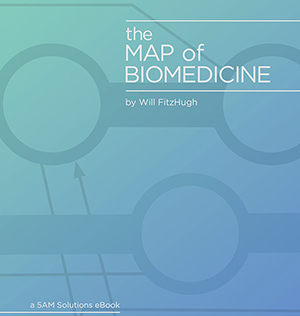 And if you read the first Map of Biomedicine series of posts on diagnostics, or read our first e-book, you’ll recognize that now we’re talking about combining drugs with genetic diagnostic tests. For example, in 2013, the FDA approved Roche Diagnostics’ cobasⓇ EGFR Mutation Test. Previously, researchers found that 10% of non-small cell lung cancers (NSCLC) involved mutations on the epidermal growth factor receptor (EGFR) gene. That finding was the basis for testing whether the use of the cancer drug Tarceva could be expanded as a first line treatment for patients whose tumors have certain EGFR mutations and for whom the cancer had metastasized to other parts of the body. 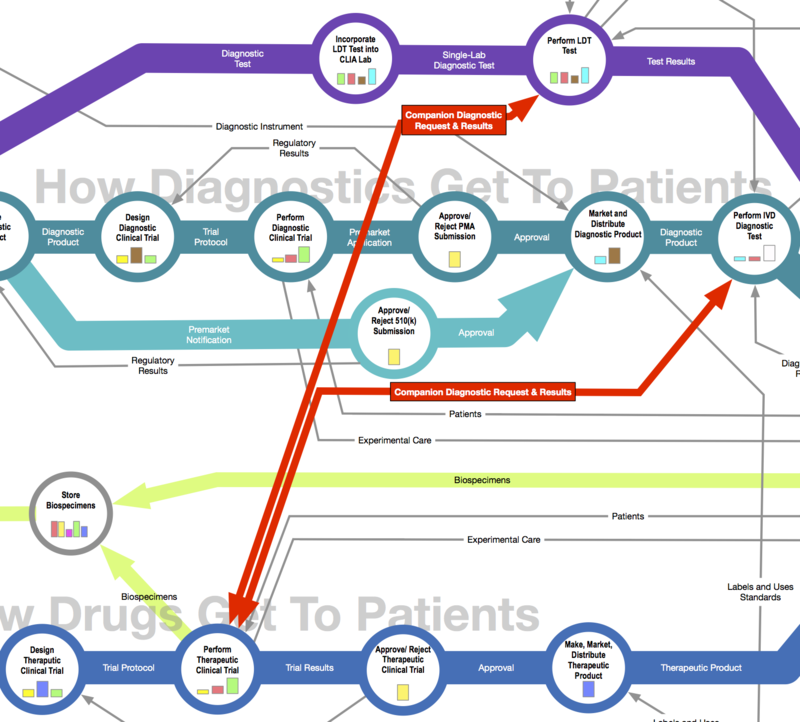 The general term for pairing a diagnostic test to a drug therapy is companion diagnostic, and you can see in the Map that there are lines that represent the use of companion diagnostics in clinical trials, which I’ve highlighted below. 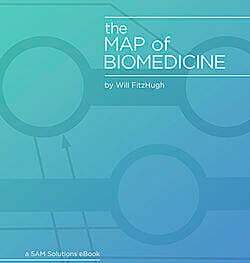 Hopefully now you can see why Map of Biomedicine is so important. Since diagnostics are now part of the drug approval process, companies must move these two types of products forward in parallel.